A screwball comedy, Ball Of Fire sparkles with wit and innovation thanks to Barbara Stanwyck's unbridled sensuality, and a witty clash-of-the-classes script. Professor Bertram Potts (Gary Cooper) is leading a group of seven other stuffy academics sequestered in a dusty mansion to write a new encyclopedia. When Potts realizes that the team is hopelessly not equipped to properly write an entry about "slang" language, he recruits a group of common people to help out. Sassy cabaret singer Katherine "Sugarpuss" O'Shea (Stanwyck) at first wants nothing to do with Potts, but quickly crashes the mansion when her mob boss boyfriend Joe Lilac (Dana Andrews) orders that she be stashed away from the police, since her testimony can incriminate him. Sugarpuss electrifies the mansion and the team of professors, and Potts finds himself irresistibly drawn to her. With the police investigation into Lilac dragging on, the mobster's lawyer decides that he should marry Sugarpuss since a wife can't testify against her husband. But Sugarpuss herself is starting to grow fond of Potts, and she won't find it easy to give up life at the mansion to rejoin Lilac's exploits. Ball Of Fire is fast, furious, funny, packed with farce, and yet surprisingly tender. Directed by Howard Hawks in the same vein as his previous screwball classic Bringing Up Baby, Ball Of Fire adds new depth to the familiar formula. 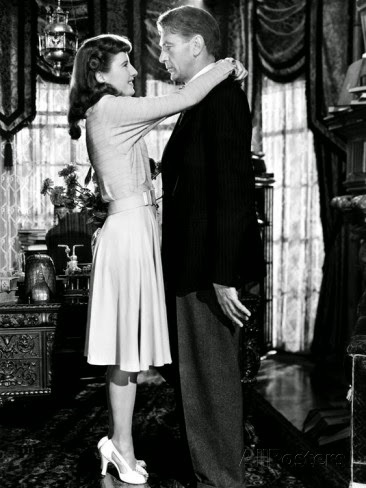 Much of the credit goes to the clever script by Charles Brackett and Billy Wilder, who surround the central opposites attract love story with layers of multiple characters, a zany energy, and refreshingly original embellishments. At the middle of it all is Barbara Stanwyck in an Academy Award nominated performance. She creates an alluring bundle of energy as Sugarpuss O'Shea, a street smart performer who can talk herself out of any situation and manipulate any man into cross-eyed, weak-kneed submission. Sugarpuss is introduced with back-to-back interpretations of the musical number Drum Boogie, once in spectacular full orchestral mode and then on a single intimate instrument: a small match box. The brazen innovation of that scene sets the stage for the film, Hawks allowing Stanwyck to lead from the front whether she is plotting her wacky hideout survival or her unlikely love life. With Cooper the stiff but slowly overheating love interest, the main supporting sub-plot of Ball Of Fire is at least partially a wacky reimagining of Snow White And The Seven Dwarfs, as Sugarpuss invades the workplace of an elderly crew beavering away on their project, and turns it upside down. The supporting professors, diametrically opposite to their unexpected guest in every way, are played for perfect laughs by the likes of Oskar Homolka, Henry Travers and Richard Haydn. They create a madcap environment of earnest academia disintegrating into a pool of juvenile lust as Sugarpuss knocks the stuffing out of their staid workplace. Even more animated in support are Lilac's two hoodlums Duke Pastrami (Dan Duryea) and Asthma Anderson (Ralph Peters). They are the rather dense go-betweens connecting Sugarpuss in hiding with Lilac, and Hawks gives them plenty of time to add colour and criminal charisma as the comedy hurtles towards a chaotic conclusion. Lighting up the sky with a streak of playful fun, Ball Of Fire is a bright blast.